Factory trained dealer/installer of custom motorcycle trike conversions. 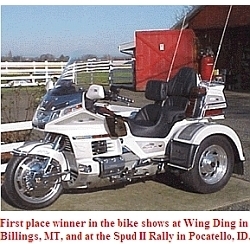 You, too, can have a trike just like this award winner by contacting 4 R FUN CUSTOM TRIKE CONVERSIONS. We are the oldest authorized and factory trained Motor Trike, California Sidecar, and Champion Trikes dealer/installer on the West Coast. Now is the time to make that dream come true and ride in comfort, safety and style on a Trike of your very own. We will be glad to price out the trike conversion of your choice, and build it just for you. Check out the Gallery Page for upgraded Honda, Harley Davidson and Yamaha trike kits. We also offer previously triked and gently used bikes for sale. We have a large supply of parts and accessories from bikes that we have converted. If you need a set of bags, rear end parts, light bars or chrome, give us a call. We may be able supply you with those parts at a fraction of the original cost. We are located in Junction City, Oregon. Copyright © 1999 - by 4 R Fun. All rights reserved.